The text is from my book, Aura Colour Therapy. The image is a picture of one of my Aura Cards. Both books and card deck are available for purchase. Authenticity Green is a slightly darker version of Healing Green. This is one of those rare colours that visually sings or ‘rings clear’ like a bell, almost to the point of being a colour I perceive as a sound, rather than an image or feeling. 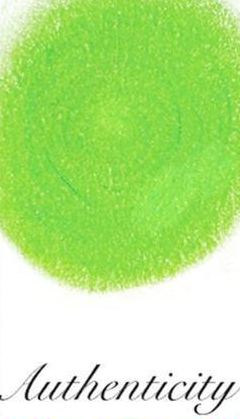 Think of clear tones with rounded fullness and absolute clarity and you will get a sense for the sound of this colour. On other levels, this colour makes me think of an oasis in the desert. Being your natural self is what makes your inner beauty shine through. The very first time I ever encountered this colour was on an inner journey. I was watching an inner self riding a bike when she fell into a mud puddle. As I reached over to help her up, tangled with bike, covered with mud, she was laughing. It was such a lovely sound and I was quite taken with her natural beauty. It didn’t seem to matter that she was covered in mud. Her beauty shone through like a light and glowed from her, making the mud itself seem beautiful. This article has been written with love for people who own a deck of Om’s Aura Cards. 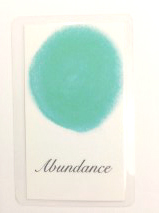 The capitalised words in italics refer to specific aura cards/colours. Butterfly wings, kingfisher feathers, openness, friendship, abundance, honesty, luck, wealth, flow, adaptability, positivity, optimism, opportunity, money, blessings. Every one of my aura colours is an on-going work in progress, like a crystal slowly being polished to reveal previously hidden facets. One of the colours that is showing me a new face at the moment is Shame Green. When I first began working with this colour, I called it ‘Deception Green’. I could just as easily have called it ‘Suspicion Green’ because it always appeared in the aura when people felt someone was lying to them. I found this colour would arise whenever people were struggling with ethical dilemmas, or questioning their own or another person’s integrity or honesty. In many readings I would try to ignore the presence of this colour, because it bought up unpleasant issues and forced me to face my own ethical dilemmas. I had to ask myself whether the client was being deceptive. Were they lying to themselves or to another? Or was someone in their lives being deceptive with them? So often, it was a mix of the two and neither issue was easy to broach with the client. Shame Green raised questions about infidelity, reflecting a clients very real concerns about the faithfulness of a partner. Did the colour reflect actual infidelity or the clients suspicion of infidelity? Using aura colours for fortune telling makes me feel uncomfortable and this colour is a perfect case in point. There was the very real risk in these situations that I could be fanning the flames of an unfounded suspicion and having a negative impact on people’s lives. I came to the conclusion that it was safer psychologically for both myself and the client, to consider this colour a mere suspicion of deception rather than thinking of it as evidence of deception. I am, after all, reading peoples emotions and thoughts in response to events, rather than events themselves. People often know when others are hiding things from them. They might even accurately guess what is being hidden. But it’s also safe to say that many of us jump to conclusions and some of us simply have trust issues and see deception hiding behind every corner. After a few years I realised there was another facet to this colour. I noticed it gave me a bad feeling that reminded me of shame and humiliation. When I started asking my clients if they could relate to this feeling, I discovered it was a real and present issue for all of them. Another year passed and I realised this colour was appearing in the aura of clients who had an extreme distaste for hypocrisy. One of my ‘Shame Green’ clients was filled with self-loathing because she couldn’t stand her own hypocrisy. Her standards were very high and she was struggling with mental health issues that were affecting her self-esteem. At this point I started to understand why this colour sometimes made me feel sick when I came into contact with it empathetically. Lying tends to make me feel nauseated. So does keeping secrets. And self-loathing is an emotion that probably makes all of us feel a bit green around the gills. The various facets of this colour included deception, suspicion, distaste, ethical dilemmas, shame, hypocrisy, low self-worth and self-loathing. All of which have a twisted, stomach-churning feeling to them. Recently, new pieces of the Shame Green puzzle have clicked into place for me. I already knew that shame can be displaced. So often, shameful feelings are habits learned in childhood or our teen years; an addictive biochemical comfort zone we subconsciously recreate over and over again. Or perhaps you could think of it as an habitual pattern of neurones firing in a particular sequence through the brain, almost like a well-worn path that has become so well-practised it’s automatic. I also knew that this colour could cause, or be associated with, infections. Especially infections that makes us feel ugly or ashamed, like unsightly skin infections, or sexual infections. Shame Green tends to make us feel unclean. We desperately want to hide our supposed ugliness away from the world, but because we believe in it so much, it leaks through the cracks and expresses itself physically. Our secret shame, rearing its ugly head. I’m now understanding that this colour can be linked to childhood sexual abuse, with all its attendant feelings of shame and secrecy. Children in these situations usually keep the abuse secret. Some are threatened by their persecutors. Others keep it secret instinctively, because they feel ashamed and they are afraid of how others might react. This instinctive hiding of secret shame can become a habit; a feeling that never quite goes away, leaking into and colouring many other events and situations throughout a persons life as they age. Family shame and skeletons in the closet can also cause Shame Green. As can teasing and bullying in childhood, or having a parent who makes you feel guilty or shame-filled in an attempt to control your behaviour. Teachers who chastise, punish and humiliate us in front of the entire class also fall into this category. Mind you, even being the odd one out who wears the wrong socks or brings the wrong lunch to school can create Shame Green patterns in the aura. My most recent revelation with this colour is the understanding that Shame Green can represent anger turned in on the self. So often during childhood when we find ourselves in painful, humiliating situations, we simply cannot do anything about it. The persecutor is usually bigger and stronger than us. The persecutor is often an elder. The persecutor might even be someone we are meant to respect, obey or even love. Someone who is always right. Someone we aren’t allowed to question. It can therefore seem safer to turn the anger inwards and believe that we are somehow to blame for the way we are being treated. For some, clearing this colour from the aura can involve learning how to feel justifiably angry at others, rather than feeling habitually ashamed of themselves. Others need to make their peace with the past, and with themselves. The journey out of shame into self-respect can be a complex and hazardous maze. If you are lost in this maze, please seek support from a specialist who can lead you through safely, such as a psychologist or psychotherapist. Once you emerge, you might well discover you are a crystal covered in mud that can be washed off, rather than thinking you are the mud itself.